The other day Aiden got all our foam shapes out so I decided to let him play with them. He did it for over an hour! 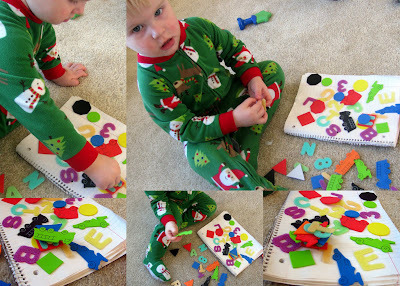 I was surprised that he could peel the backs off the paper from most of the shapes anyway. He was alsod funny to watch because he would really take his time in laying them down, like he was trying to find the right place. I wanted to take a picture of him with his art work but he was too mad that I was making him stop doing it. But it was lunch time and I was hungry. The final piece. I don't know how many he had stacked up under the T but there was a lot. So cute! I love his naked pictures too! Our boys would get along just fine!